practice asking, requesting and providing information. 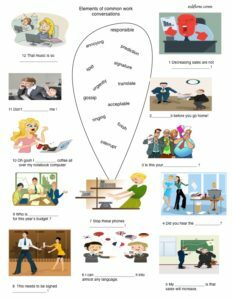 This is an elementary business English ESL exercise exploring the language and vocabulary used to make short conversations in various business and social situations. Students use their imaginations to write short conversations for each situation. Then they can compare answers. Click on the image below or the link to download the printable PDF file. 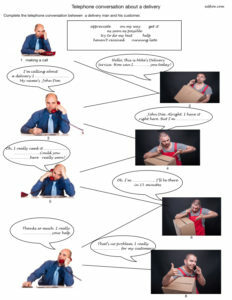 This is an elementary ESL speaking exercise for talking about problems in the office. First, students try to match the vocabulary at the bottom of the page to the pictures. They can then use that vocabulary to answer questions about the pictures. Click on the image below or the link to download the printable PDF file. This is a telephoning exercise for English language learners to practice using elementary language necessary for business and making phone calls. Students complete the conversation with the vocabulary in the box. This is a Business English ESL exercise to help students learn how to make polite requests in English. 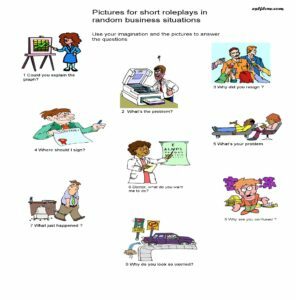 The pictures provide contexts so the students can more fully engage with the meanings and uses of the vocabulary. Click on the image below or the link to download the printable PDF file. Students need to be versatile and flexible when they speak English. This gap fill exercise provides a number of everyday conversations and situations . It challenges students to complete the short dialogues with the appropriate vocabulary. Click on the image below or the link to download the printable PDF file. 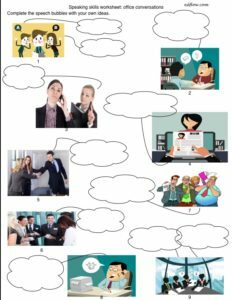 This is a business English office and telephoning language exercise to help English language learners practice expressions and phrases used in everyday office conversational exchanges. This exercise helps students study a dialogue and become familiar with common office conversations. 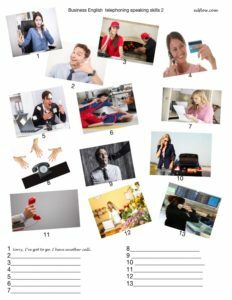 This is an ESL speaking and writing lesson for talking about common business activities and tasks.. First, students match the expressions to the pictures. Then, they can have short conversations discussing the business activities they like and dislike. 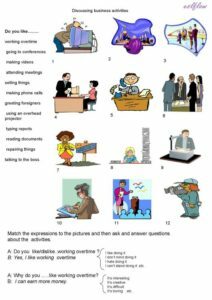 This is an ESL exercise for teaching common English expressions in an office setting. Students match the words to the pictures and the sentences. Click on the image below or the link at the right.to download the printable PDF file. 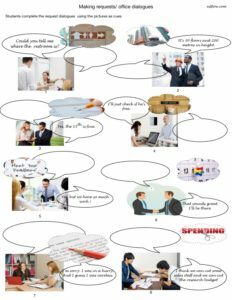 This is a business English ESL exercise to help students practice common office conversations. Click on the image or the link to download the printable PDF file. 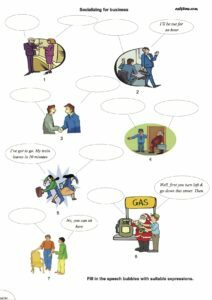 This is a business English ESL exercise introducing some common expressions and sentences. Students need to interpret the meanings of the woman’s gestures and match the vocabulary to the pictures. Click on the image below or the link to download the printable PDF file. This is a telephoning language exercise for English language learners to practice the English expressions and phrases used in everyday phone calls. 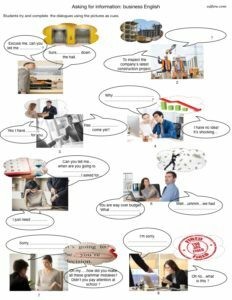 This is an elementary business English ESL exercise exploring the language and vocabulary used to make short conversations in various workplace situations. Students use their imaginations to write short conversations for each situation. Thanks for making this very useful teaching material available to all. Grateful me ! No worries. It’s great to get a good response. What you do is EXCELLENT. Thank you for being here for us! Thank you for your comments ! Much appreciated ! Thank you for this awesome material. I’m sure my class will enjoy it. Thank you, this is a very useful collection! Wonderful , amazing work , Thank you so much.